I did it! I finished my first bed sized quilt! Thread: I did it! I finished my first bed sized quilt! I used my embroidery machine to make the blocks then did the joining, sashing, etc. I sent it out to be quilted as I just don't have that skill set yet. Boy does it feel good to have it finished! I started it in December for my son. I have three more sons so am hoping to make them all quilts this year. I think if I keep it simple I will be able to do it. I'm feeling more confident. This is the first (successful) time I've done binding. I still need to go over it with a zig zag... I watched several video's on how to do binding on a machine rather than sewing the final step by hand and tried that. It worked OK but doesn't look as good as hand binding and the edge isn't secured so I don't think I'll do it this way again. Boy is it hard to sew on something this big.... I can't even imagine how hard a king size quilt is going to be to maneuver. Wow! I love it, your work is beautiful. Nice choices for a son's quilt! It's lovely. To me, it looks "celestial". Thumbs up! Congratulations! Looks beautiful and a job well done. In my dream world, fabric is free and sewing makes you thin. Congrats on your finish! I love the design and it looks great with the black background fabric. What threads did you use? Your quilt is sure to bring an extra hug...or two... from your son. That looks great!!!! Love the designs on it!!! Family is a priority, not a convenience! Take time to be friendly... It's the road to happiness. Take time to give... It is too short a day to be selfish. That toy was the first thing I thought of when i saw your lovely quilt. Your blocks seem to glow in the night sky. Great job! Spectacular! .... agree on the Spirograph look. Now we see where you have been using all those much-loved Hemingworth threads! You can master the binding challenge ... it just takes a bit of practice to feel at ease with it. One big quilt like that would probably do it. So for son #2, go for it! I also like it - a lot! So nice! Where did you get the embroidery designs? 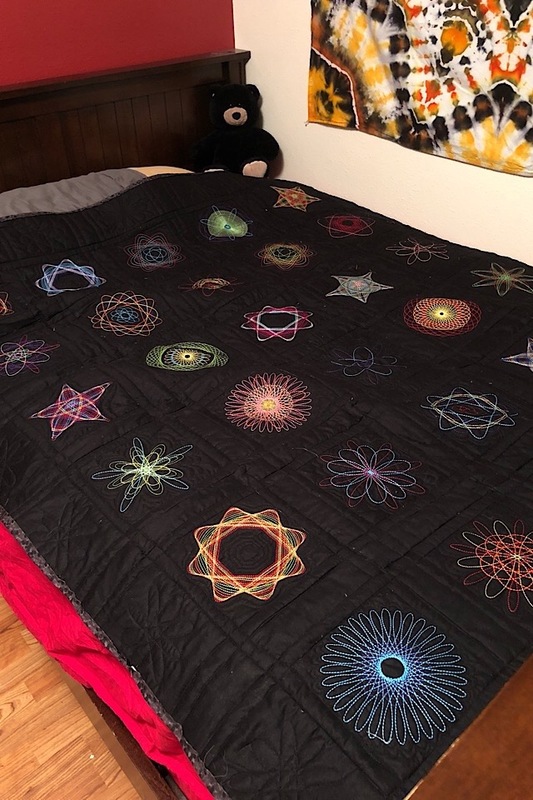 They are beautiful in the thread you used, and great for this guy quilt. Your Quilt is beautiful. Your son will love it. That is sooo cool----I love it! You did a great job! Great quilt! The block remind me of the Spirograph I got one Christmas. Definately like a spirograph...Lovely quilt! Stunningly beautiful, the black really enhances the colors. Really cool design and colors! Congratulations on finushing your first bed size quilt!